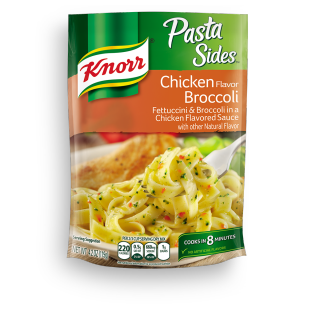 A creamy, chicken-flavored sauce and the bright taste of broccoli make our Chicken Broccoli Pasta Sides a surefire way to bring great meals like our Loaded Chicken Broccoli Pasta to your table. Chicken Broccoli Pasta is rated 5.0 out of 5 by 2. Rated 5 out of 5 by DaNi from Chicken and Broccoli Pairs well with ANY dish!! YUM! Creamy and filling and for a great price! Highly recommended to any family to please both adults and children! Rated 5 out of 5 by Banana from SO GOOD I absolutely love this side dish above all the other's that Knorr makes. It's sooooooooooo good. I just wish I could make it myself so I could get more veggies out of it. I have, however, added frozen broccoli florets in it because I wanted more veggies and it's still good. It's definitely worth at least trying. It's also quick and really easy to make.